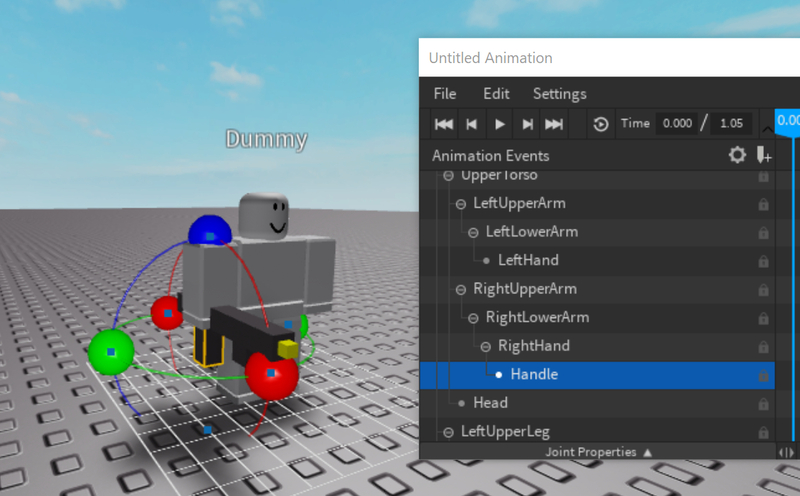 Hey everyone, I’ve answered the question about how to animate a tool, such as a weapon alongside a rig/dummy a few times now and I thought it would be useful for the some members in the community if I made a tutorial about it. First things first, you’ll need to pick out the object you’re animating along with your Dummy. 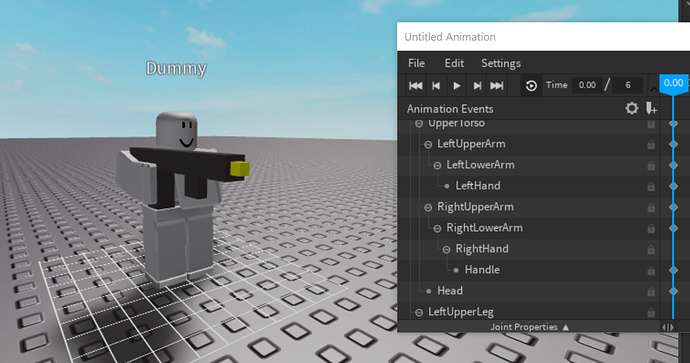 For this example I’ll be using a very simple ‘Gun’, and an R15 rig, however you can follow similar steps for R6 which I will add below. You should download this plugin before proceeding to make things way easier in this tutorial. Let’s get started. Firstly, we’re going to prepare our tool. If you’re using the Weapon I attached above, you can skip these steps, but be sure to read them regardless. Position it where you’d like the tool to be held from. 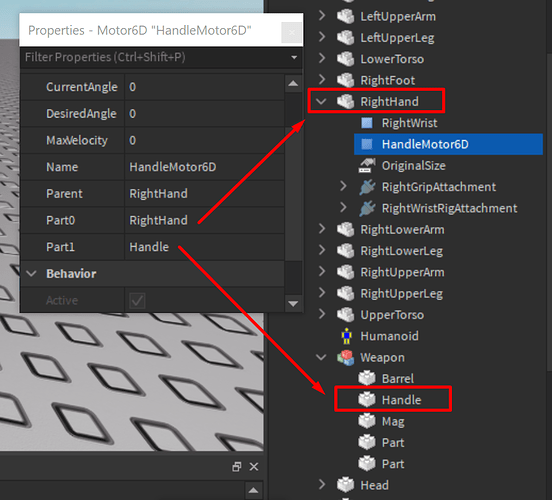 This part will act as the ‘Primary’ part of the tool and everything will be linked to it. Take the gun and unanchor all of the parts. Group all of your parts. 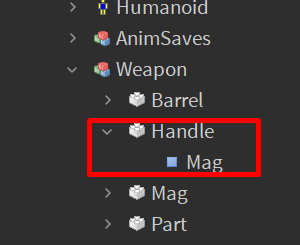 At this point you should have a Model with a part called ‘Handle’ inside of it. The rest of the parts don’t matter, you can have as many as you want. Now, we’re going to Weld the parts together so that they don’t fall apart when we’re trying to animate. This will now weld all of the parts in the model to the Handle part. You should get something like this. Note that the Handle itself should not contain any welds. Here’s what your setup should look like right now, the red arrows indicate where I got the Part0 and Part1 from. You should also see the Handle under ‘RightArm’ inside the Animation Editor. You can now move/rotate the Handle, which will move/rotate the whole gun. This tutorial may look complicated at first, but don’t be put off by it! Once you get the hang of doing this, it will become a second nature and will be quite easy to do very quickly. Here is a .rbxl of what you should have at the end of this tutorial. You can use this to see how things are set up if you’re confused. Thank you @helloguys34 for introducing me to this concept. How to animate mesh part on a gun? How to rig a weapon in animation editor? Liked, bookmarked, and shared. Exactly what I need, thank you so much! This is a really well written post. Thanks for making this! Great tutorial. It’ll help me a lot with learning how to animate with gears! I have a question, would playing this animation actually use the tool? Such as rotating the handle to the right, would this duplicate to a real tool, if you were using one? Awesome. I figured this would be the case because the animation editor listed only picked up the handle. I tend to manually move the arms for guns, or whatever else I need to make. It’s not a good solution however I never knew how to integrate animations with tools. This might just save me some time! Before, I’ve used a somewhat hacky method of this process which involved a welding script and the command bar. You don’t need to parent the Handle anywhere. 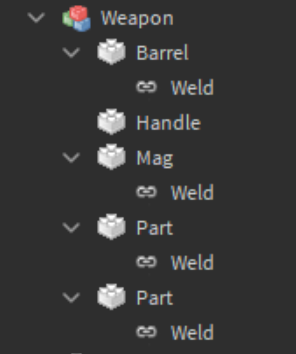 When the tool is equipped you can change the default tool weld in the RightHand to a Motor6D instead, and set the Part0 to RightArm and Part1 to Handle (of the gun). 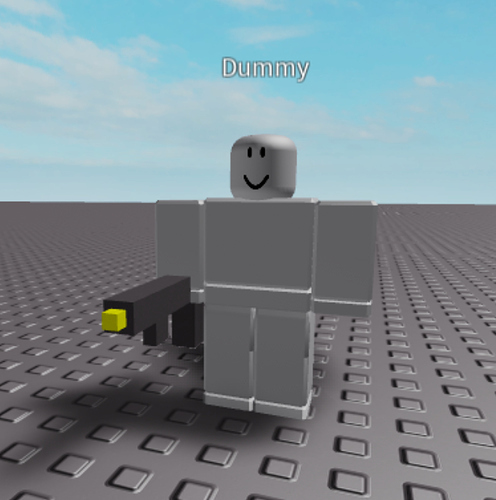 This will allow any animation involving the gun itself to play. 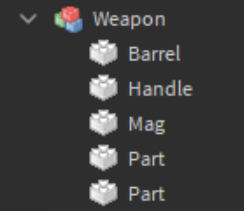 Would you guys like me to make a tutorial on how to animate specific parts of tools/weapons? Oh hey, you’ve gotten a lot more into this now. Glad I could help you with getting started! Can you swap out the gun model but keep the animation? What if you use a model that doesn’t have a gun with this animation? Can you swap out the gun model but keep the animation? I don’t get what you mean by this - you mean remove the gun model and animate the character without it? What if you use a model that doesn’t have a gun with this animation? The above file doesn’t have an animation I’m pretty sure - if it does - oops. If you play this animation on a player/model that is not holding a gun with a Motor6D in the handle it will just play the animation as if the gun was never there. Yes if you set it up correctly by following the steps outlined in the main post. This is part two of this tutorial, and here I’ll be showing you step by step how you can animate multiple parts of your weapon/tool if you wish. This could be useful for things like pulling the chargeback handle on a gun after reloading it, or for manipulating smaller details on your tool. Without further ado let’s get started. We’ll be animating the Magazine of the gun. 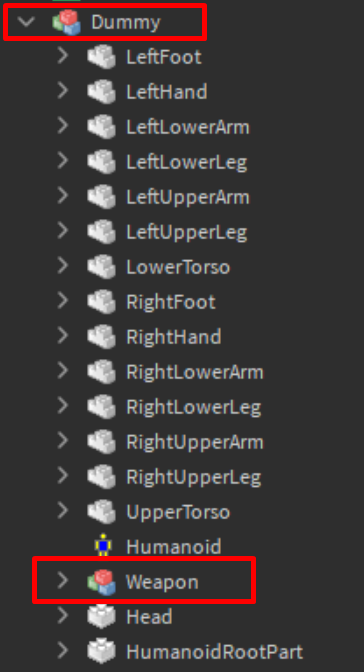 You can replicate these steps exactly for any amount of parts for the weapon or the tool you’re animating. Here’s the file of progress up until this point. 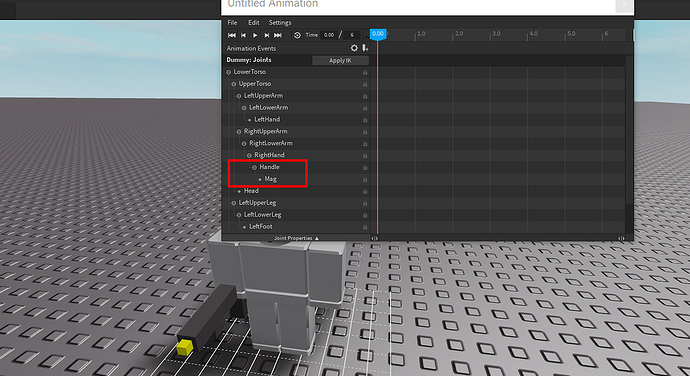 Now, how do we put t into a script, so the player does this in game? If I’m understanding correctly, you have created an Animation and would like to play it in-game?